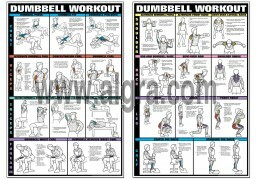 This dual set of Dumbbell Set Workout Poster is all you need when wall space and time for working out is limited. These 2 free weight posters include everything you need in a concise approach of having two or three exercises to develop and strengthen each major body part. Great illustrations, great colors, great body building posters for those looking for a great workout routine. Full color detailed poster available in 24" X 36" Laminated, and Framed.